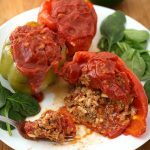 Instant Pot Stuffed Peppers are so easy to make, and very tasty! A great weeknight meal. Thank goodness for the electric pressure cooker! I use My Instant Pot several times a week. Pressure cooker Stuffed Bell Peppers are always a win in my house. Oh boy, was I excited to make these Instant Pot Stuffed Peppers! This is total comfort food. I have fond memories of Mom making these in the tiny kitchen of my childhood. Mom was a wiz at stuffed foods. Everything from stuffed peppers to stuffed cabbage rolls, and she could feed a crowd! She made hers in the oven, and I do too sometimes. But… if I don’t want to turn on the oven and heat up my kitchen, my Instant Pot is a great option, and cooks these stuffed peppers perfectly keeping my kitchen cool. 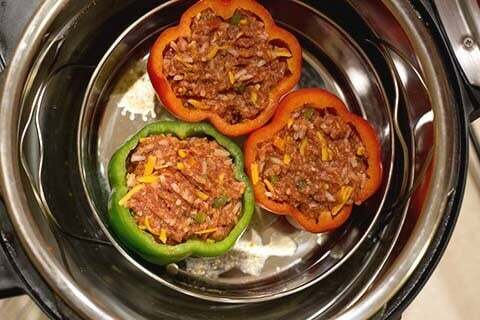 For these pressure cooker stuffed peppers, the meat goes in uncooked, but the rice is already cooked. You can use parboiled white rice if you’d like. Here I am using the Pot in Pot method, which means I put the peppers in a separate dish to cook in, and that goes into the pressure cooker’s cooking pot. I like to do this when I have a sauce. You can just put the peppers directly on the trivet if you’d like. Add the sauce to the peppers right before you close the lid. When choosing your peppers for this recipe, try to get the smaller sized bell peppers so they will fit in your pot. I can usually get 4 small or 3 medium sized bell peppers into my 6 qt pressure cooker. 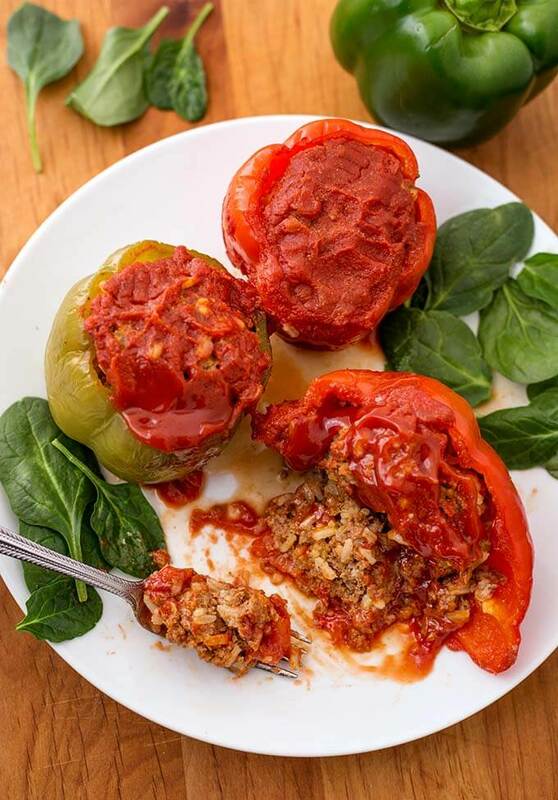 Delicious Instant Pot Stuffed Peppers are made with ground beef or turkey and rice, and are easy to make, and very tasty! A great weeknight meal. Put the cup of water into the inner liner of the pressure cooker. Also place the trivet in the pot for the peppers to sit on. Rinse the peppers and cut the tops off. Deseed and remove the membrane (Then use a small knife or a fork to poke a few holes in the bottoms of the peppers so they can drain the liquid). Add the ground turkey or beef (raw) and all other ingredients (except for half of the tomato sauce and half the cheese) to the mixing bowl. Mix to combine thoroughly with the rice. Place stuffed peppers on a trivet in the Instant Pot. They will be sitting above the water. *See note. Press the Pressure Cook/Manual button, and the +/- button to select 8 minutes. High Pressure. After the cooking cycle ends, let the pot sit and undisturbed for 5 minutes (5 minute Natural Release). Check the internal temperature using an instant read thermometer. The temp should be at least 165° for ground turkey, and 160° for ground beef. If they aren't fully cooked, put the lid back on and cook for 2 more minutes, then check again. Sprinkle reserved cheese on top of each pepper and put the lid on to melt it. Remove peppers with tongs to serve. *You can cook this pot in pot if you don't want to set the peppers directly on the trivet. Just put them in the pan and use the trivet with handles to lower it into the pot, as well as lifting it out of the pot. Use caution when removing as it will be hot, and could slip off of the trivet. You might have to cook the 6 peppers in two batches if you can't fit them all in the pot. You can try stacking them, though if they are too large they may not fit. Delicious! Love my Instant Pot and also tried your baby back ribs for dinner the other night. Amazing, and I love how simple you make the construction of recipes easy for everyone. I am 77 years young so more difficult to adjust to new ideas and ways of cooking. I remember how difficult the microwave was when it first came out and have two now when I didn’t think I would ever use one. That’s great, Geraldine! I’m so glad you also liked the ribs. Yes, new gadgets often become essential parts of our lives. I can’t imagine not having a computer, or a cell phone! 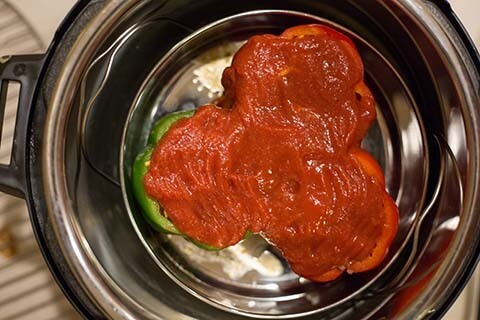 Just a question…my husband and I like a tomato soup sauce poured over our peppers, but even when I water it down ( 2 cups water/one can soup) the IP won’t come up to pressure before it starts cooking time countdown and actually starts to burn on bottom. Any ideas? Hi Kathleen. The way I have found around this is to either use a pot in pot pan that doesn’t have holes in it, and put the peppers with sauce in them (water on bottom of pot). Or, as in this recipe, make the sauce separate, in a saucepan (or even the microwave). Tomato sauce burns very easily. I hope this helps. I bookmarked this recipe a few weeks ago because our family loved it! However now the recipe appears to have changed….can you post the original recipe? It was a little spicy but super flavorful. I also loved the speed of using uncooked rice and didn’t have trouble with it being cooked through. Did you just use a stainless steel bowl for pot in a pot? Can you use a glass dish? Thanks! Hi Cathy, I like to use stainless, but you can try an oven safe dish that you have on hand. They can slow down the cook time a little, but if the peppers aren’t done enough for you, just pop them back in for a couple more minutes. My peppers completely fell apart in here. Should I cook for less time? tastes great though! Hi Rosemary, I would try doing a quick release and see if that helps. Just make sure the meat is cooked through. If that doesn’t work for you, use the time in the recipe as written, but cook the peppers in a dish (Pot in Pot) on the trivet (water underneath) and see if that helps. The PIP method will slow down the cooking a bit. Hi Jimmy! That’s so great! Nothing better than knowing someone who is hard to please enjoyed on of my recipes! I’m so glad! Thank you so much for taking the time to review these stuffed peppers! BTW, Bag of Donuts? If that’s literal, yes, please! Just bought my 6qt instant pot. Finally after looking at it for several days I tested it. Works good. When you say put a pot in it ( example stuff peppers) will any pot do or are there accessories that one buys specially for this purpose . Hi Robin, congrats on getting your pot out of the box! The Pot in Pot (or PIP) method as we call it, is when you cook something in an oven safe dish within the pressure cooker’s inner liner. If you look at this post on accessories, you can see several ideas. Also, the thrift store might have something! My friend, Neena, from Paint the kitchen Red, has a great article on PIP cooking, and some good recipes, too! I just made these today – yum!!! Easy recipe and easy instructions to follow!!! Thanks so much!!! That’s great, Cheryl! Thank you for your review! I made these for dinner tonight in my 6 qt. Ultra Instant Pot. I have not eaten stuffed peppers since I was a kid, because as a child, I did not like them. My mother used green peppers and I thought they were kind of gross. But these were so good, I will definitely make them again. I made four stuffed peppers, using two red peppers, an orange and a yellow. I followed the directions and they turned out perfectly. Husband also liked them. Thank you for such a great recipe! Hi Farrel! I’m so happy that this recipe worked for you! Sometimes it just takes a different version, and you find that you now like something you didn’t before! Thank you for your review! Loved this recipe. I used some leftover quinoa in place of the rice, through in some shredded Mexican cheese, also left over, filled 5 large red peppers, cooked for an extra 3 minutes and, Voila. Awesome supper! I have some left over cooked ground meat. How long would you instant pot it? Just a few minutes, Sharon. It will depend on what you are cooking along with it. Did you put the pan or dish on the trivet first or did you just put it in the water? I put them on top of the trivet. 4 peppers or 6 peppers? I try for 4, if they will fit. Otherwise 3. Hi! We tried this tonight for supper and we all loved it! I had three huge yellow peppers and I did pack in the meat pretty tight, so I increased the time to 12 minutes. They we’re all cooked through and perfect! We didn’t add the cheese, but it still had a great balance of flavors! Thanks for the recipe! That’s great, Sherry! Thank you!